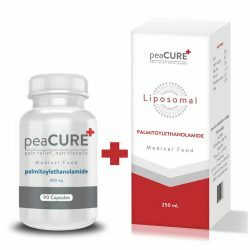 If you have read about how peaCURE works, you have seen that it is a fatty acid amide which is naturally present in our bodies and also naturally broken down by FAAH and NAAA cellular enzymes. This means that any extra amount of peaCURE that is not absorbed, immediately gets broken down by the mentioned enzymes. Many drugs have plethora of adverse side effects, negative effects on the surrounding tissue, negative interactions with other drugs, issues with habituation which leads to lower efficacy and the need for higher dosages and dangerous overdose levels. peaCURE is pharmaceutical grade palmitoylethanolamide devoid of any fillers, excipients, additives or taste modifiers. 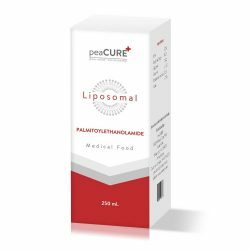 So far there have been more than 400 studies including palmitoylethanolamide and not a single side effect has been confirmed.The only two warnings regarding the use of palmitoylethanolamide is to increase the dosage slowly during the first week in case you have clinical liver or kidney deficiency and that there have been no tests dealing strictly with its use during pregnancy. Due to this lack of conclusive information, we advise you to avoid any use during pregnancy. In several older studies there have been reports of mild gastric issues, but it is believed that they resulted from the sweetener called sorbitol which was used at the time. peaCURE has no sorbitol or any other additive. Similarly, there are no reports that peaCURE damages any other cells and tissues, regardless of the amount you take. As for habituation and overdosing, peaCURE has no issues with those either. The more peaCURE you ingest, the more of it builds up nutritionally inside your body and the more efficient it is. Most patients with chronic pain conditions have serious issues since their bodies get used to the amounts of painkillers they take in and they require more, which inevitably leads to more severe side effects, as well as more damage to the internal organs such as stomach, liver and kidneys and eventually loss of efficacy. Increasing the dosage of painkillers without limits would lead to overdose and there is no overdose level with peaCURE.Always consult with your health specialist when using peaCURE. How come peaCURE is completely safe? 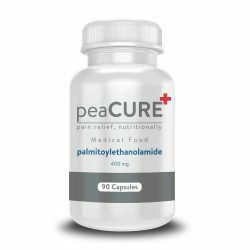 We have already said that palmitoylethanolamide is an endogenous and harmless fatty acid easily broken down by cellular enzymes. Moreover, it has been present for so long that we might consider it a part of evolution by now. It is present in humans, but also animals, plants and even single-cell organisms such as yeast cells and it is essential for protection and balance of the internal state of these organisms. Plants even use it to protect themselves when they lack water and this is the most severe damage most plants can encounter.